A look at the TSA's new guidelines for protection against monkey bombs, AirTran and Southwest exchange ads in a commercial war, instructional video of how NOT to land an Ilyushin and more! 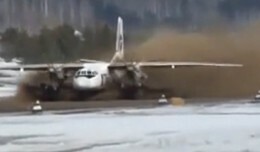 What do you do when your 200-ton Soviet-era Antonov An-124 cargo jet gets stuck in the mud and the nearest tug is on the other side of the Urals? GUN IT. Boeing has announced its intentions to update the engines of the current 737 airliner and launch a new line of jets dubbed the 737 MAX family. Boeing has completed the first power-up and engine testing of a General Electric GEnx powered 787 Dreamliner.